What if you could still do all of the activities that you currently do well into your 90s? Do these ten things and your odds of reaping a long, healthy life increases dramatically. 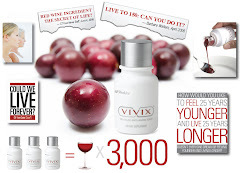 I add Shaklee's resveratrol anti-aging tonic to my body everyday to help protect and repair the DNA of my cells. 1. Diet and Nutrition. This is your biggest weapon in the fight against aging. Eating a healthy diet without skipping meals or starving yourself and supplementing with a balanced mix of nutrients, vitamins and minerals can stop the aging process in its tracks. What is a healthy diet consist of? Eating whole foods like fruits, vegetables, whole grains and fish. Yes, this means ditching boxed, packaged, and convenience foods. 2. Breathe. Monitoring and focusing on the breath is a healing mechanism that has been used for centuries. Take a deep breath in, hold and then slowly release. 3. Drink plenty of water. Water has been called the elixir of life. Our body is comprised of about 60-70% water which is constantly being depleted through excretion so it makes sense to replenish it. 4. Get moving. Remember Newton’s Law of Motion – a body in motion stays in motion. An active lifestyle will extend your life and make it more enjoyable. I spend many afternoons barefoot in the garden. It's a lifestyle I've chosen for myself. If you would like to choose how you spend your day's we need to talk. Bottomline take a walk, go for a bike ride or work out at the gym. Do household chores. Go dancing. Just keep moving. 5. Work those muscles. Strength training creates strong muscles, which serve to support our joints and decrease the likelihood of injury. Bone density increases dramatically, reducing our risk of osteoporosis. Strength training enhances quality of life, as it enables us to better perform daily activities that require lifting, pushing or pulling. Women who are trying to reduce body fat, add a little strength training to the mix and you will do so more easily. When done sufficiently and consistently, strength training increases muscle fiber size. Once muscle fibers enlarge, they consume more energy – which boosts our metabolism which decreases body fat. I add take a Cinch Shake daily with Leucine this helps build muscle too. 6. Touch and be touched. Research shows touch deprivation in children not only causes them not thrive but also has an adverse effect on body image. Adults suffer from the same effect. Don’t have a significant other? Schedule a massage and get one at least once a month. Massage therapists are usually very nurturing by nature. 7. Live in the moment. Experts claim that focusing on the here and now, and taking life one day at a time, helps you stay calm, grounded and present. This allows you to have a stress-free life. Studies have shown that too much stress can actually age a person. 8. Take a mental retreat. Spending just a few moments imagining a peaceful scene floods your body with feel-good chemicals that reduce stress, boost immunity, and promote healing. Here is one of my favorite short video's I use for my mental retreat. 9. Get involved and help others. Longevity experts agree that maintaining social networks is critical as we age. The more activities, groups, and classes you’re involved with, the better (and longer) your life! Also, helping others by volunteering for causes that are important to you have been shown to promote feeling of gratitude and report a higher level of well-being. 10. Think positive, think young. Our thoughts create our lives. You are what you think about most of the time. Believe you will never get old, follow the tips above, and stay young and healthy longer. If you do these steps, life will also become a whole lot more fun.